Somewhere in Germany, March 1945. About one full day into the advance, a German officer waving a white handkerchief from a long twig, emerged from within the tree line. The German officer retrieved his so desired piece of bread, after all nobody wanted it. He was very grateful, a smile pierced his face and thanked all the boys with plenty of “danke schön”. He promptly stuffed it under his jacket, clicked his heels, and smartly saluted. “… We searched him for hidden weapons, grenades, or whatever and found him clean …” continued Salins ”… Next, doing the interrogating in the best « deutsch » I could muster, I asked for his name, rank, and unit. He introduced him as Major Hoffman and informed us that he was the Regimental paymaster of a Volksgrenadier Regiment. His headquarters had been overrun two days prior by one of our armored divisions, and he had escaped with as much of the Regiment’s pay as he could carry! He impressed us with that fact because he felt if he were ever reunited with his troops, they would need this money in as much as they had not received any pay for three months. We told him to forget it!…” . Salins and his squad mates dispatched the German Major to the custody of the MP’s but kept the case. Elsenborn Ridge – 27 December 1944. 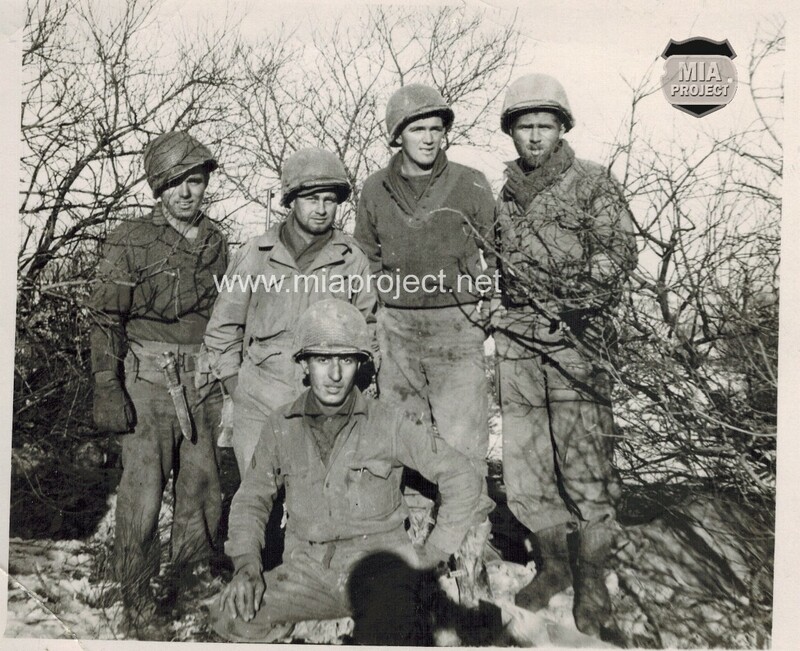 Sid Salins (kneeling) and squad mates. The squad resumed its advance along the woodline and as the first shades of darkness approached, they came upon a triangular stand of three Sherman tanks. As was common practice among armored outfits with no obvious enemy presence, three tanks would often park in the shape of a triangle, the center area was then used as a sort of small enclave, within which the men could shave, wash, eat or just shoot the bull. As Sid Salins’ squad walked by this little fortress, they noticed the tankers had a fire going in and they were dangling cans of c-ration from bayonets they held over the fire. They were merrily simmering from the heat, and enhancing their drab flavor. In the immediate background was a heavy safe, door ajar and containing stacks of the same crisp 20 mark notes previously ‘liberated’. The tankers systematically reached in for a new supply to throw on the fire and speed up the heating process of their meager rations. The squad current objective was reached in the course of two days. Many days, and months, followed. After VE Day, Sid and several of his company fellows remained in Germany for occupation duty in the vicinity of Neustadt/Aisch. Mainly watching the rubble get cleaned up, helping military government taking over all administration of the defeated nation and eventually the rehabilitation of German homes and businesses. The lone member of our squad, during combat, who had decided to keep his share of the « worthless » dough, was immediately summoned to compare dates and serial numbers. AND IT ALL MATCHED! PFC (name kept untold), owned a sweet little nestegg of quite a few thousand equivalent American dollars, which were later to finance him through nine years of higher education, and the start of a very successful professional career back in the good old USA! Alas, the rest of our infantry squad had squandered thousands of dollars. We had literally had, « money to burn »! Sidney D Salins was finally discharged on 22 January 1946 and came back home where his wife Betty was waiting for him. Together they raised 3 children. 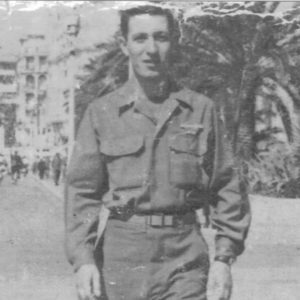 Sid was a member of the 99th Infantry Division Association. He passed away on September 24, 2006 at his Silver Spring, MD, residence.